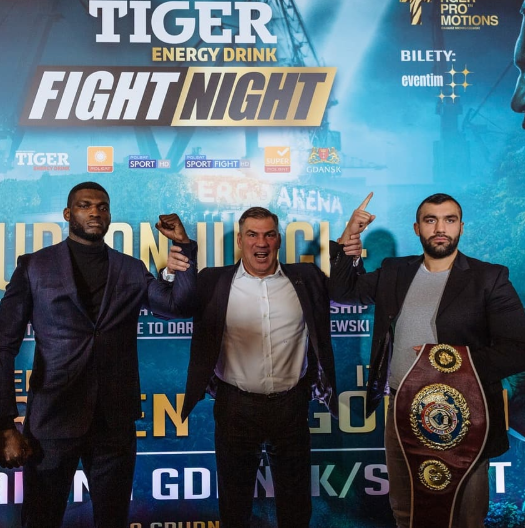 On December 8, “Tiger” Dariusz Michalchewski celebrates its premiere as a promoter in co-promotion with Tiger Promotions and EC box promotion at the Ergo Arena fans can look forward to a great main fight. Both promoters take full risk and face their current best heavyweights against each other: WBO European Champion Ali Eren Demirezen (10 fights, 10 wins, 10 by K.o.) defends his title against Izuagbe Ugonoh (19 fights, 18 wins, 1 loss 15 by K.o.). Demirezen has won so far all of his fights prematurely, Ugonoh has a knockout ratio of 79%. Either way this is a real treat for all boxing fans. Demirezen, born in the Turkish Samsun, was able to prevail prematurely against Poland’s Sergiej Werwejko. Ugonoh defeated Fred Kassi in two rounds in his final fight. His only defeat was conceded against American Dominic Angelo Breazeale by knockout in round 5. For both promoters, the event in Gdansk is a prelude to further joint events. At the WBO convention in Panama, more shows have already been staged for the coming year. It is quite possible that the “Tiger” will then return to his old hometown of Hamburg. But then as a promoter.